Chow and Chatter: Butternut Squash: Indian Style! Ingredients: 1/2 a butternut squash, 1/2 red onion, masala powder, chili powder, salt, mustard seeds, coriander seeds, 4 dried red chilli's. 1. heat canola oil and pop mustard seeds add onion, coriander seeds and chilli's, after 5 min add masala powder and chili powder to taste. 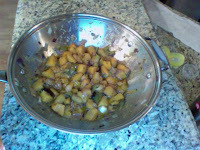 2. add chopped butternut squash and cover with a lid cook on medium heat for about 20 min until soft. This is a great and spicy dish rich in vitamin A, Vitamin C and Potassium. hmmnn.. no butternut squash here..I think our local market only sells the fairytale pumpkin..
What a delicious way to prepare the butternut squash. YUM! I am adding your button to my blog, by the way. Yummy squash. Perfect for summer dish right here! I love this and it's so easy to make too!! This does sound delicious. I'll keep it in mind for cooler summer days. I have half a massive spaghetti squash in my fridge and will be trying your recipe with it tomorrow....I love Indian flavors...I hope the texture of spag squash goes well with them! Thanks for another fabulous recipe! Yum! I love all the spices in this. I love butternut squash. Would this dish be as delish cold for those really hot summer days? If I can find butternut squash I will be giving it a try. Thanks for the recipe. One of my favorite things! I love this spicy version! Wonderful flavors for the butternut squash in this recipe! I am so behind! This look absolutely delicious. I've got a mess of sweet potatoes that I know would taste awesome prepared this way.